Hello! 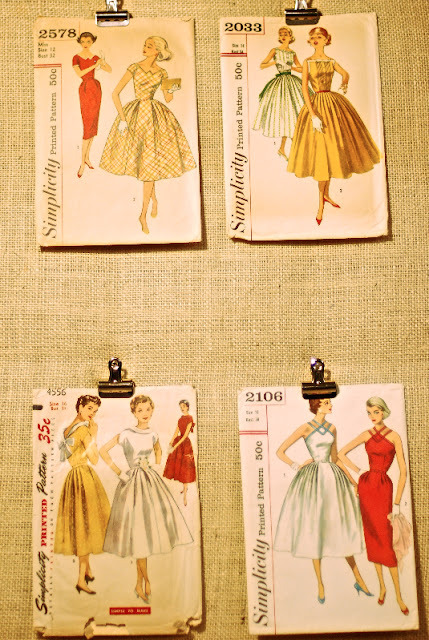 I'm very happy to be here sharing vintage patterns with you. 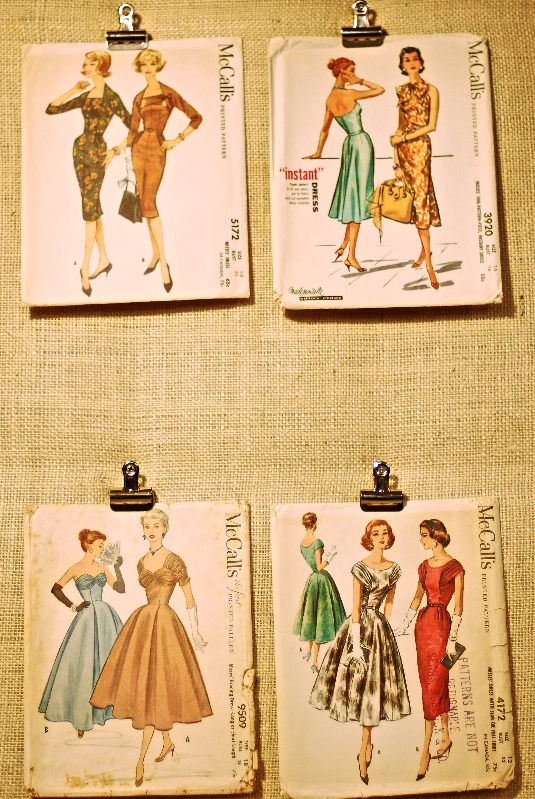 My name is Michelle and I am a vintage pattern addict. It's been incredibly fun to discover new patterns and to see all the gorgeous contributions to Vintage Pledge. I hope I am able to return some of the inspiration you've shared with me by showing you some favorite patterns from my collection! I started collecting vintage sewing patterns while I was searching for and collecting vintage knitting patterns. 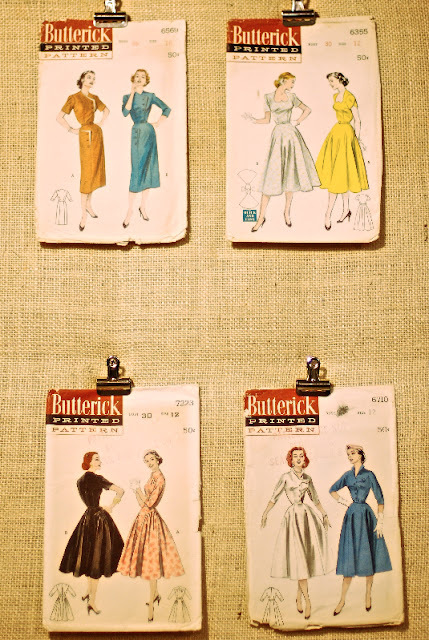 I had yet to start sewing at the time I started collecting sewing patterns, but I’ve been a fan of vintage styles and fashion as long as I can remember. 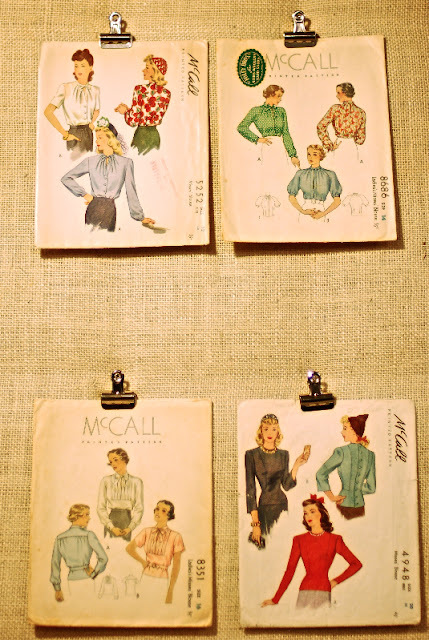 The crossover from vintage knitting to vintage sewing seemed like a natural progression. Initially, I didn’t seek-out vintage sewing patterns. I bought them casually when I found them at thrift shops or garage sales. As my interest in sewing increased, my pattern collection expanded. The short answer: A LOT. I haven't counted them all. My personal collection is approaching one thousand. However, more than half of the patterns I've amassed are stored away in bankers’ boxes. They’re patterns that I’ve acquired in bulk lots and do not consider part of my primary collection. I’ve sold some, gifted others and ‘shop’ them when I get the urge to add to my stash. Mostly, I hold on to them because some part of my brain is convinced that I'm doing a service to future vintage pattern seekers by preventing them from being used for wrapping paper, scrap booking or decoupage. The patterns I’ve curated for myself, I store in an old Simplicity pattern cabinet. I keep the pattern pieces and instructions in manila envelopes and organize them by manufacturer and number. The manila envelopes are sturdy and can handle thumbing and flipping without any devastating effects. 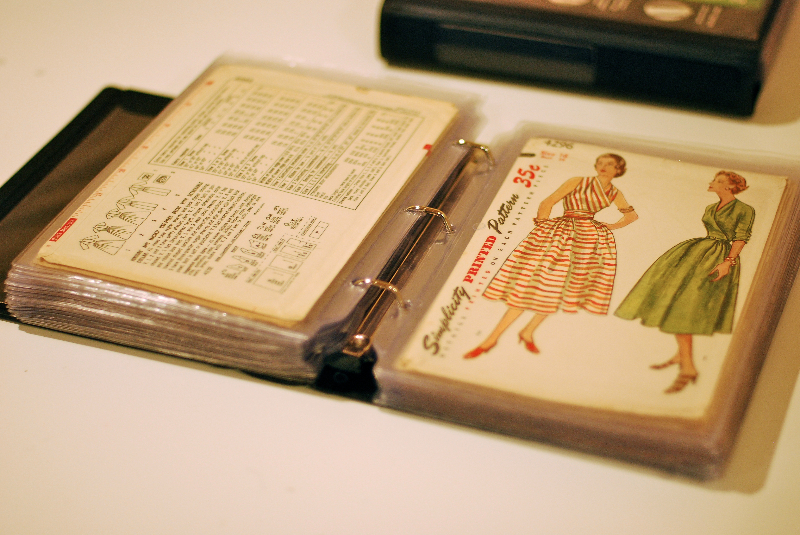 To preserve the condition of my pattern envelopes, I keep them in acid free sleeves and store them in binders. Some of my pattern envelopes are in poor and fragile condition. Storing them this way lets me handle them without additional wear and tear. Details. They really don’t make them like they used to. 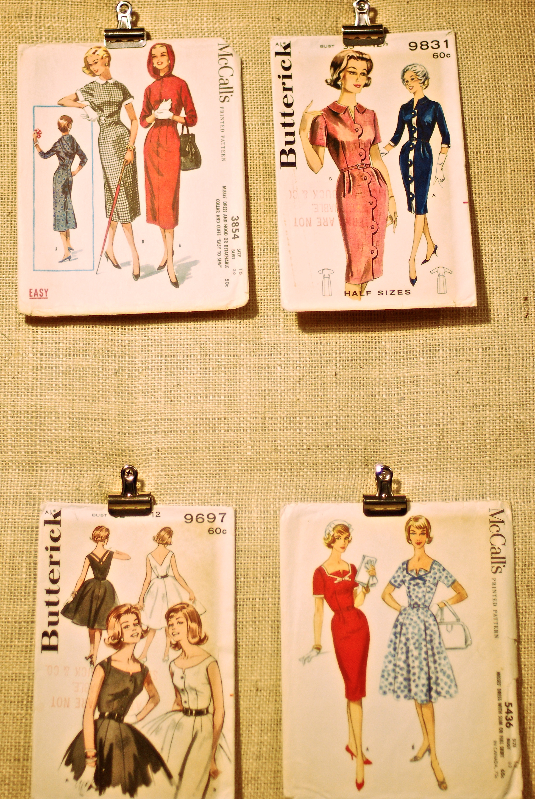 Vintage patterns have incredible style lines and design details. I love neckline and back interest, pockets, seams, straps, collars, embellishment, piece-work, shape, anything that makes a garment unique or unusual. When I come across something I haven’t seen before, I have a strong urge to take it home with me. I love them all! More than anything, I'm drawn to classic styles that blur the lines between decades. I like to mash-up eras and mix a bit of vintage with a splash of contemporary. I’m all over the map when it comes to choosing patterns. For me, vintage is all about influence and inspiration. 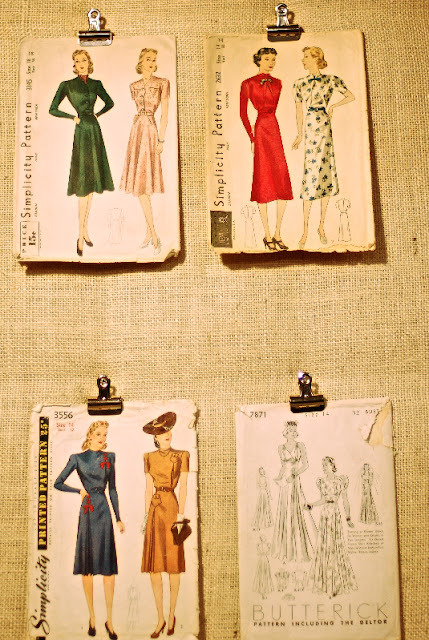 I love looking at a garment and finding elements from bygone eras. It's never my aim to look vintage or decade specific. I'd much rather wear a 30's blouse, sewn using 60's fabric, paired with a 70's skirt and keep people guessing which is which. 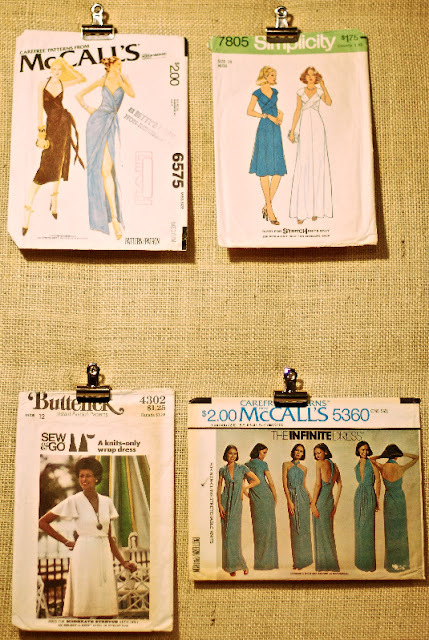 Recently, I've started sewing with knit fabrics and have been finding lots of pattern options from the 70s to consider. The seventies also seem to be the current momentary direction of mainstream fashion, so I've been drawn to patterns from this decade a lot lately. 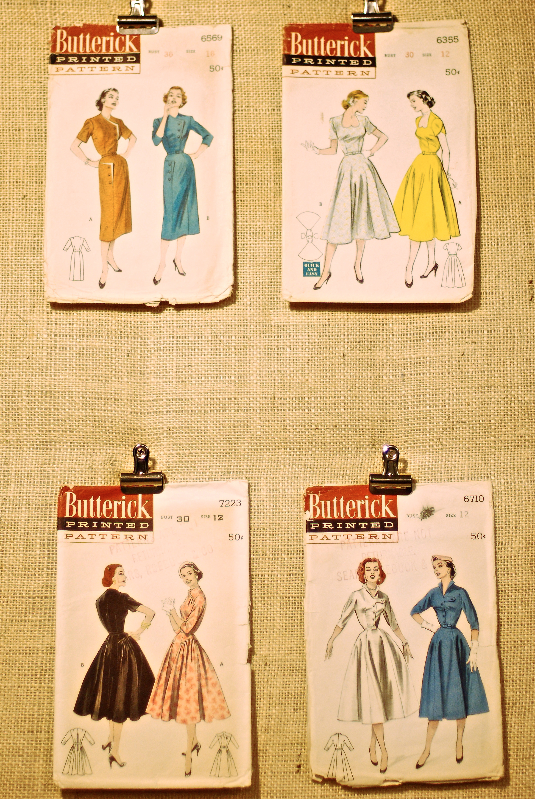 It's hard to determine exactly which pattern is the oldest, but I would guess Butterick 7871. 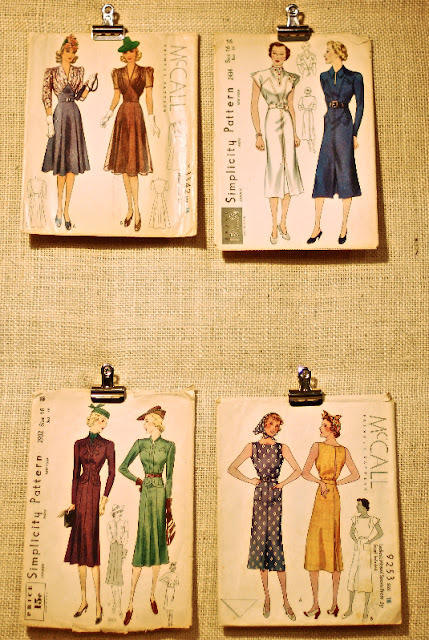 Generally speaking, my pattern collection is 1930s and onward. Sadly, I haven't sewn Butterick 7871. This is an impossible task. Like a mother with her children, I love them all and for different reasons. Instead, I think I'll cheat and choose three patterns I plan to make this summer. Hopefully, telling you that I plan to make these will keep me accountable! Once, during a discussion regarding my pattern stash, a non-stitching friend asked if I planned to sew all the patterns I have in my collection. Truthfully, I would LOVE to. It's not an impossible goal. I have a lot of life ahead of me, and if time allowed, I think it would be incredible to sew each one. There are some patterns, for practical purposes, that are low on my priority list. For example, I have a series of little girl's Prominent Designer Patterns by Florence Eiseman. I think they're absolutely fantastic. However, I can only see myself sewing them if I have a little girl at some point. Even if I don't get to sew them, I plan to keep them, because they're so darn cute. I get patterns from a lot of the usual suspects: Ebay, Etsy, etc... However, I estimate that more than 90% of my patterns have been purchased at estate sales. I've been very fortunate to shop the estates of some ladies who share an appreciation for sewing and vintage patterns. A lot of Chicago's sewing and fabric suppliers haven't survived the years, but there used to be bustling sewing and millinery departments at the State Street Marshall Fields. 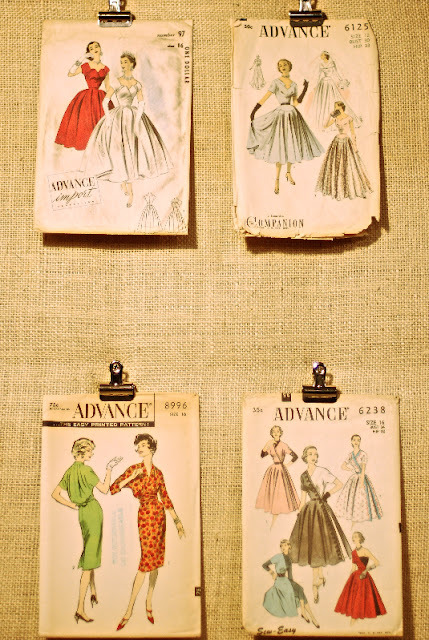 As a result, there are a lot of treasures buried in the basements of seamstresses of yesteryear waiting to be discovered! Estate sale shopping can be thrilling. I never know what I'm going to find, but all the materials are vintage and, typically, very inexpensive, which makes it easy to get a little carried away. Thank you for letting me share my stash and thank you to Marie and Kerry for being wonderfully gracious hostesses during this year's Vintage Pledge! Happy Stitching! Have you joined the #vintagepledge yet? You'll want to once you check out the awe-inspiring Pinterest board! Whaaat!!! And here I thought I knew you Michelle, LOL! I did not know about how deep your passion for vintage patterns runs! What a fantastic collection! And the attention given to proper storage is impressive. Before, I just wanted to come and play with your puppies...it's now obvious that after the puppy play, I'd be happily immersed in all things vintage. Oh, how I wish I could stumble across some vintage patterns at one of my thrift stores! One store actually was using their patterns for wrapping china!!! Horrors! They gave me what they had for free, but unfortunately, none of them were what I would call vintage. Goodness, what a fantastic collection! I adore some of those early McCall and Simplicity patterns!! The blouses in the first photo are especially charming. Thanks so much to Michelle for sharing her collection with us. If you are looking for more people to share their vintage stash please let me know. 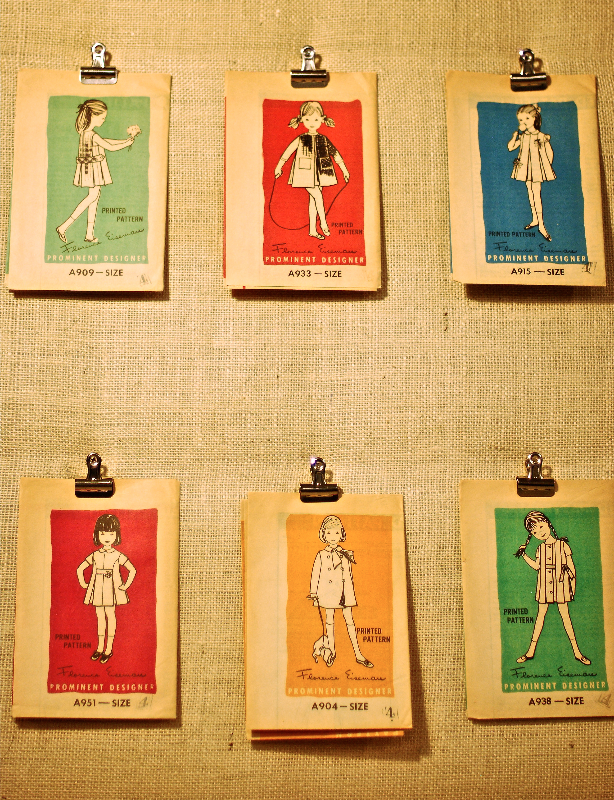 Lovely display and photographs, and a very inspiring collection! Wow! So many amazing patterns!! Michelle, I had no idea your collection ran so deep! You're an archivist! Michelle, my hat is off to you. Preserving all these glorious patterns is a such an important gift to all those in the sewing world. Thank you for sharing your passion! I too have many old patterns but not as many as you do. Love the Simplicity filing cabinet - I'm going to speak to the local fabric shop because they can't get the patterns any more (long story). Where did you get your acid-free sleeve protectors and binders where you store your pattern envelopes? Hello! Asking your local shop about their cabinet is a great idea! I found my on craigslist, actually, and I have seen them at the occasional garage sale. I bought my sheet protectors online from a site called My Bindings. They have a wide variety of sizes. 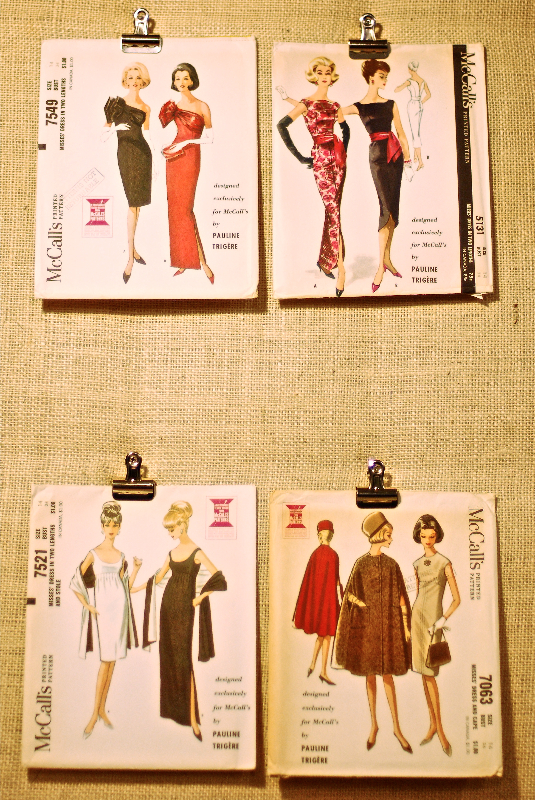 I've found that Simplicity and Vogue patterns fit perfectly in the 5.5x8.5 sized cover, and McCall's need a 6.5x8.5 sleeve to hold them without creasing. This is incredible, what a collection! I love Michelle's philosophy about mixing decades too, that's the way to make sure you don't feel too 'costume-y'. Also, that Simplicity pattern cabinet is fantastic. I'm in awe of this collection. Thank you for sharing some of it with us!